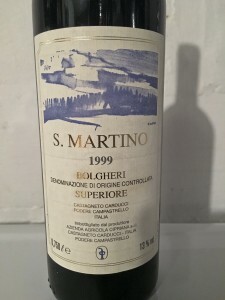 I purchased a few bottles of the 1999 San Martino, and of course opened one that night. All I could think was- Italian Bordeaux!, This is one example of why wine growers chose this region to break the rules, and introduce non indigenous grapes, Italian-style. The next day I returned to the store and bought all they had left, 26 bottles. 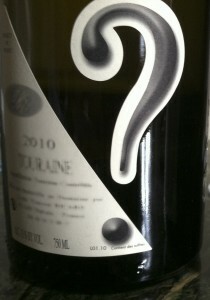 Over the years I have opened bottles of this wine and honestly it has been hit (home run) or miss. Some bottles have been clearly past their prime, and some are still drinking beautifully. I am down to the last two, and I am bringing them both to celebrate the year that the first OTBN occurred, 1999. This entry was posted in Bolgheri, Cabernet Sauvignon, Italy, OTBN, Super Tuscan and tagged OTBN, Super Tuscan by toleranttaster. Bookmark the permalink.